next post: Can we really say the US economy is in recovery? A regular occurrence is the prediction of doom for Japan. Some minor upturn in Japanese government bond yields or a movement in some other irrelevant financial statistic relating to the Japanese public sector sends the financial press into apoplexy. But the Japanese economy continues to defy all these prophecies from the neo-liberal zealots and eventually they will be dismissed by the broader public as the education process continues. The latest dramas surround the massive purchases of Japanese Government Bonds (JGBs) by the Bank of Japan. The fact is that the Bank of Japan is currently exposing the myths of the mainstream position even if it would not see it that way. Our post child just keeps giving us real life examples to substantiate the views presented in Modern Monetary Theory (MMT). 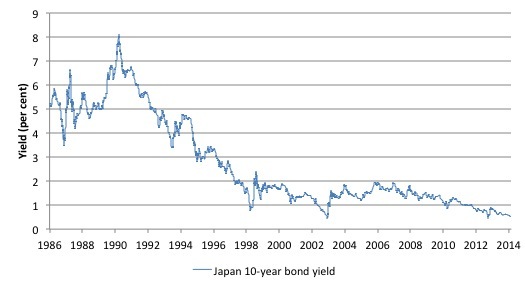 You might like to refresh your memory of the history of the Japanese 10-year bond yield since it was first issued on July 5, 1986 to August 29, 2014. The daily data (all 10,360observations) is available from the – Ministry of Finance). How would you assess economists who have for years been claiming that yields would spike up any time now and the Japanese government would not being able to continue to spend – that is, it would run out of money? Clue: Fu&king Stupi@ will do. For years, various economists and the financial commentariat that echoes the words of the academics and bank economists, have been predicting various disasters would beset Japan for running high public debt to GDP ratios. The sky remained in place. Then in May 2013, they all thought their predictions were on the cusp of being realised. The financial commentators went ballistic about that little upturn in the yields (red arrow in the following graph) which sent them apoplectic and the predictions were that it was all about to collapse was finally manifesting. Apparently, the bond markets were finally calling in the piper and unless the Japanese government instituted a major fiscal austerity campaign all hell would break loose with respect to yields. At the time I commented – noting this was all nonsense. Here is the close up from the beginning of 2010 to August 29. 2014. The explosion in yields predicted in May didn’t seem to pan out. We also learned at that time that the Bank of Japan was buying up government debt at its leisure, from which we conclude that the Bank of Japan is a monopoly supplier of bank reserves denominated in Yen. 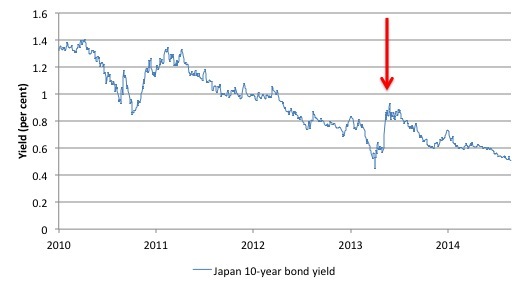 We now have much more data available (to August 29, 2014) and since then the Bank of Japan has conducted itself in an admirable fashion and demonstrated that private bond markets are effectively irrelevant to the course of public debt yields should the central bank desire that to be the case. We also have a living laboratory to show that governments that issue their own currency do not have to issue debt to the private markets. And,we are also being shown in real life, that inflation does not accelerate out of control if they do not issue debt to the private markets but rather the central bank buys the majority of the new issues up. There was an article in the Economist Magazine (August 30, 2014) – Quantitative freezing – which considered recent developments in the Japanese bond market. AS PART of its quest to end Japan’s 15-year-old deflationary torpor, the Bank of Japan is buying around 70% of all newly issued Japanese government bonds (JGBs). 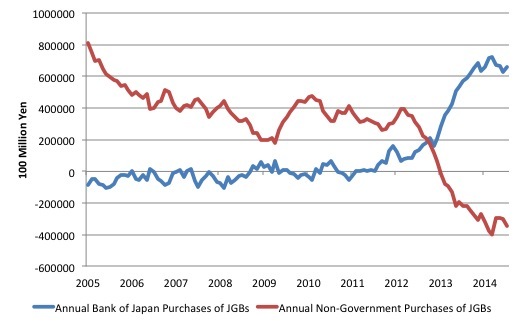 The following graph shows the annual purchases of Japanese Government Bonds (JGBs) since the January 2005 to July 2014 by the Bank of Japan (blue line) and the Non-Government sector (red line). I didn’t plot the purchases made by Japanese government agencies. There has been a dramatic increase since the beginning of 2013 in Bank of Japan purchases. In fact, the Bank of Japan purchases have exceeded the primary issue and run down the stock held by non-government sector wealth holders. 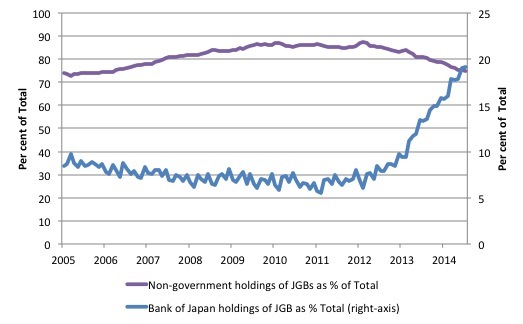 The next graph shows the share of total outstanding JGBs held by the Bank of Japan and the Non-government sector since January 2005 until July 2014. Note that the BOJ holdings are on the right axis. While I haven’t time to break down the Non-government holdings into the constituent parts, the Bank of Japan is now the largest single holder of outstanding JGBs at just under 20 per cent of the total. The next largest are the insurance companies (close to 19 per cent), then small to medium financial institutions (around 16 per cent), domestic banks (around 13 per cent), Overseas investors (8 per cent) and households around 2 per cent. The various government bodies (other than the BoJ) have about a 9 per cent stake. What has been going on? Simply that the Bank of Japan has embarked on a large-scale bond purchasing program as part of its plan to force the private investment community to invest in more risky assets. The clear outcome has been that bond yields have continued to fall. This proves without doubt that the central bank can control the price that the Japanese government has to pay on newly issued debt. Never believe anyone who says the bond markets call the tune when it comes to a currency-issuing government. The central bank in that sort of nation always calls the tune. They can set the yields and other rates at whatever level they choose, including zero, by using their currency-issuing capacity (which is infinite) to demand any volume of debt that the government chooses to issue. In these cases, if the private sector desires to hold the debt it is forced to do so at the yields set by the Bank of Japan. There goes one of the major elements of the scaremongering logic. Their claims about bond markets and yields are patently false. Now the interesting sideline to this issue is that the private bond markets are now screaming there is not enough public debt available to them! Hilarious really. By dint of the Bank of Japan scaling up its public debt holdings, the volume of such bonds available for speculative trading in the private bond markets has fallen dramatically. There was one particular day (April 14, 2014) where the current 10-year JGB wasn’t traded at all in these markets which was considered a major event. The shorter maturity JGB (2-year and 5-year) are now often recording zero daily trades. … the vast scale of the purchases has certainly warped the world’s second-biggest sovereign-debt market in ways the Bank of Japan did not foresee. First, they note that this “has left the private sector little room to influence the price of JGBs”. The point I made earlier. Read that again and be prepared to quote it next time you have the unfortunate experience of being at a dinner party with idiot right-wing people who think they know about financial markets. Second, the yields are actually higher than they might be because the non-government bond holders are hanging onto their portfolios. So, there is still solid demand in the non-government sector for JGBs. Another myth eroded. Third, the bond traders “are making rather less money than before” because the tradable volumes are so low. The consequence is that “Trading desks could be pared down if volumes fail to rebound”. That is, these highly paid gamblers who exploit the risk-free nature of government debt to make millions for a tiny number of wealth holders and divert real income from productive investments towards totally unproductive economic activities are going to have to find another job. Hopefully they will seek out something that will give back to society rather than undermine societal prosperity. All of which doesn’t seem to be the slightest problem at all. If taken to extremes, the wilting of the market could become a problem, making it harder for the government to issue debt and the BoJ to trade it. First, it proves that the government doesn’t need to issue debt anyway. It can just do some accounting tricks with the Bank of Japan whereby the currency-issuing capacity of the latter becomes the spending power of the former. A totally positive outcome. Second, the Bank of Japan could just write all the debt off anytime it wanted to with zero consequences. There are a number of commentators claiming the Bank of Japan is now extremely exposed to any rising interest rates (because the value of the bonds would fall). The value of the bonds could fall to zero and the Bank of Japan would face no detrimental consequences. Another myth exposed. The only downside is that the falling non-government sector holding of JGBs reduces the income flow from government to non-government sector. That might be good from a distributional point of view (reduces the corporate welfare that benefits mostly the rich and high income earners anyway) but from a macroeconomic perspective it requires an equal stimulus coming from fiscal policy to avoid a decline in growth. But that just means the Japanese government should offer a Job Guarantee or some other spending initiative to ensure that growth picks up and unemployment and underemployment falls. Japan has been a gem for demonstrating the neo-liberal myths about government deficits, debt and central bank debt purchases, inflation and bond yields. It is a living laboratory that should give you confidence that Modern Monetary Theory (MMT) is a much more robust explanation of what happens in a monetary economy where the government is sovereign (issues its own currency) than the mainstream economics approach. Aah, but Japan is just a special case … did I hear that? Go away and speak nonsense elsewhere. If you go to the homePage of the Bundesagentur für Arbeit (German Federal Employment Agency) and poke around a bit you will arrive at the public tender page. The current tenders available for bidding (and supply) were released for public information on August 29, 2014 and are listed as – Infrastructure Tenders. Hmm, what could the German Government be seeking by way of public infrastructure? New school buildings for the migrant workers’ children to give them a chance in life? Perhaps some new urban development in poor neighbourhoods ravaged by the Hartz reforms (Mini Jobs) and the lack of growth? Could be some new medical services? Well, we are on the right track with medical services. The Tender Document – 1213-14-45216 – Drogenschnelltests und Harnanalyse VT – is seeking submissions for the “Lieferung von Materialien für Drogenschnelltest und Harnanalyse”, which for those those who cannot read German is for the supply of materials for rapid drug tests and urine analysis. Ziel der Ausschreibung ist der Abschluss eines Liefervertrages für die bundesweite Lieferung von Schnelltests zum Nachweis von Drogen im Urin sowie von Teststreifen zur Harnanalyse. Diese werden für die Durchführung ärztlicher Untersuchungen in den Agenturen für Arbeit benötigt. Which means the tender aims to elicit supply contract for the nationwide delivery of rapid tests for the detection of drugs in urine and test strips for urine analysis. These are required by employment agencies to conduct medical examinations on income support recipients (unemployed) to determine whether they can receive support or not. Parameters: amphetamine, benzodiazepine, cannabinoid (THC), cocaine, methadone, Methamphetamin, MDMA (ecstasy), opioids, tricyclic antidepressants, barbiturates and buprenorphine (BUP). Imagine the dystopia that is emerging – thousands of unemployed all lined up with para-medics forcing them to undertake medical procedures just in case, in their alienation and despair at being jobless, they have imbibed on something other than alcohol or nicotine. The tender closes on September 23, 2014. I urge all my readers to submit a tender document and let the German Government know what you think of them treating their unemployed citizens in this way. Make sure you satisfy all the good character requirements that the tender documents outline so that you avoid breaking German Federal Law. The requirements are rather extensive. f only the recipients of the tenders had similar characteristics! Anyway, go on, flood their administrative processes with submissions. As a historical note, in past times, the German government ran tenders for Zyklon B. Bill, this tender is not much different from Reagan’s demand that all employees, especially all government employees, be tested in order to see whether they should keep their jobs. Only real difference is the group under attack. I guess in submitting a tender, I ought to refrain from swearing at them. You know, that’s a shame, because recent research shows that people who swear regularly in their daily conversation, in a non-insulting manner, are more honest and trustworthy than those who don’t. This list is idiotic. Let me mention only one item, tricyclic antidepressants. WTF??!!! This was an antidepressant of choice for the medical profession before the advent of SSRIs. But SSRIs do not suit everyone. I do not know what is going on in the German medical profession, but it is clear that their association has decided that tricyclics oughtn’t to be prescribed. I guess it doesn’t matter that someone has been on them for over 20 years and had no problems, and being unemployed may need them, being unable for some reason to tolerate the available SSRIs. There are resonances of the UK laudanum scandal at the turn of the last century here. Many people died, as might be expected, from withdrawal. Most of the rest of the list consists of the usual suspects, which are on the list for the usual suspect reasons. &*%$#@. Carney’s been reading your blog Bill! Robert Peston is just repeating someone else’s opinion of a statement by Mark Carney. The “Hmmm” seems to indicate some degree of scepticism. RP has never to my knowledge shown any indication of understanding/agreeing with the MMT version of macroeconomics. larry,tricyclic antidepressants are usually prescribed as a last resort these days. One of the reasons for this is that they are an extraordinarily effective means of committing suicide by overdosing. Depressives are more prone to suicide. But that list is bit of a ragbag isn’t it. Removing the income of drug addicts? Do they think there isn’t enough crime in Germany? Why don’t they drug test bond traders ? I’d guess there would be plenty of Peruvian Marching powder making its way into their nostrils. Podargus, while what you say is true, that is surely no reason for it to be on this list. And what about methadone? Ragbag captures it, I think. It is almost as if they went around a table of school kids and asked them what bad things people shouldn’t take and produced this list from that exercise. Alan Dunn, Bernie Madoff’s premises were known as the North Pole. Bill, how is the Japanese economy performing in terms of employment growth? I’ve heard other commentators say the Japanese economy is stagnant. Clearly the government there isn’t afraid of its debt ratio, but where are they deploying the resources? Is that the reason for Japan’s continued stagnation? I do not believe unemployment levels are very high. Bill, how is the Japanese economy performing in terms of employment growth? Hi Anthony, I find “Trading Economics” pretty useful when you want to know stuff like that.